Internet Dental Alliance now publishes a monthly Dental Marketing Intelligence Report™ that simplifies strategic dentist website planning. I can use the Dental Marketing Intelligence Report™ to predict what dental consumers want – and whether potential new patients are going to feel secure and confident enough to set appointments for dental treatment! The new Dental Marketing Intelligence Report™ is now available from Internet Dental Alliance, Inc. (IDA). It provides in-depth analysis of Google search data for general consumer demand trends as well as for the top 11 treatment markets. Dentists can use the findings in the Report to maximize results from their websites' lead generation campaigns. The Dental Marketing Intelligence Report™ is based on the keywords consumers use when searching online for products and treatments. 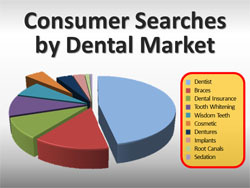 It provides a 12-month overview of consumer keyword search trends indicating demand for dental treatment services within the overall economy. The Report then looks more closely at search data for 30 keyword phrases in the top 11 dental consumer markets, such as braces, tooth whitening, wisdom teeth, cosmetic and others. Dentists can see the amount and direction of change in each of these markets compared with data from the previous month. Within each if the top 11 dental markets, the 15 most frequently searched terms are identified. Dentists can see which of these keywords are gaining or declining in popularity, and the direction in which the category is moving in general. This information is invaluable for planning successful targeted online lead generation campaigns. "The data from the Report combined with IDA's unique LeadFire technology puts dentists in full control of their online marketing," adds Jim Du Molin. "They can launch targeted campaigns within minutes." The Dental Marketing Intelligence Report™ is available by monthly subscription, or is included as a bonus for no additional charge to dentists who purchase IDA's New Patient Marketing Machine™ -- a turnkey internet marketing solution that requires minimal set up time. IDA is the largest provider of dental directories, websites for dentists and email patient newsletters in North America. In 2012, it completed its unique Lead Fire lead generation system, which automates dental SEO and content marketing. LeadFire technology allows doctors to begin generating new patient leads within minutes of set up. It uses organic geo-targeted local search which is customized and optimized for each dental office. The Internet Dental Alliance provides online dental marketing services such as website design, marketing newsletters, and other dental management advice and resources.